Go straight/go forward, along the street, turn right/ to the right of, turn left/ to the left of, over/under the bridge, at the end of the road. 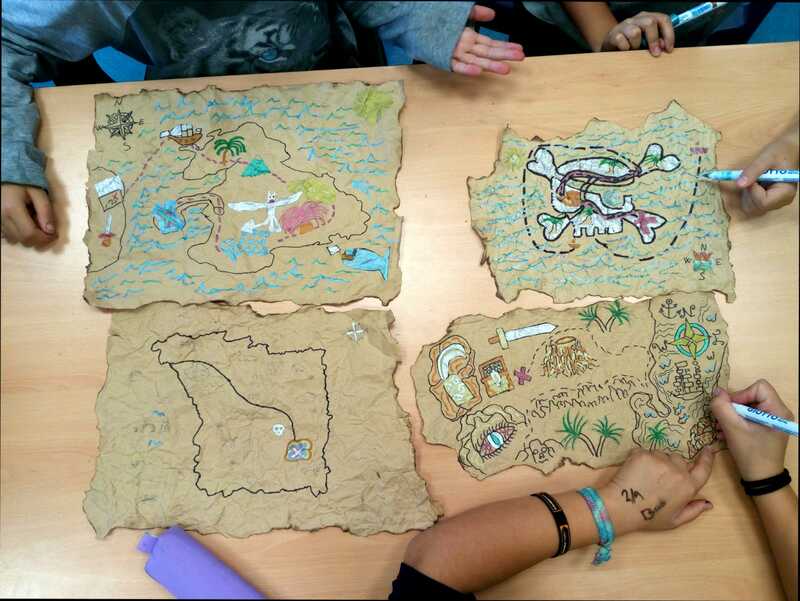 They planned and then drew treasure maps and wrote directions to the X marks the spot where the treasure is hidden. 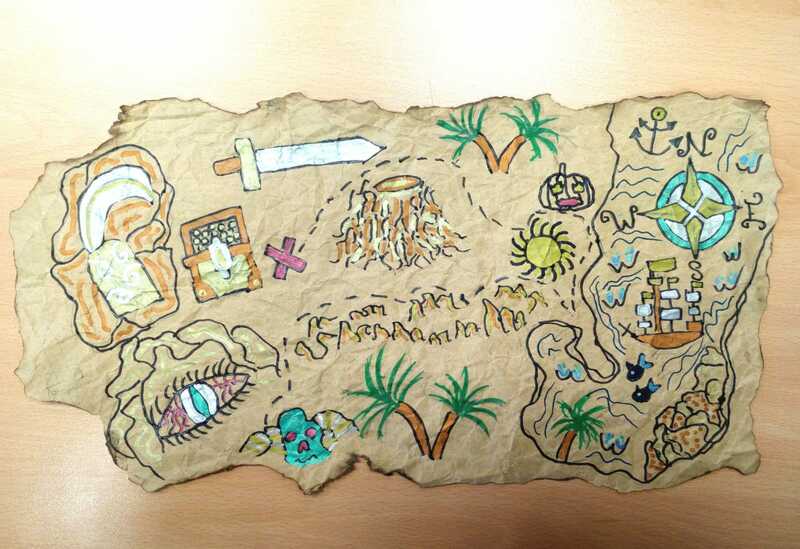 We used and practiced vocabulary such as island, palm tree, hammock, key, spade/shovel, eye patch, man with a scar, east, west, north, south, threaten, sails, hook, gold coins, binoculars, digging / burying treasure chests, and holes. These days are special at school! We are into Halloween mood!!! We have organised different activities to celebrate it! Below you have a link to see & enjoy with some pictures of these days! Have a great long weekend and enjoy Halloween! With P4 and P5 we went to plaza Clara. The students had to find the witches hat , the witches couldron, candies, magic stars , a skeleton's hand and orange balloons. It was real fun !!! Last week we played different games related to this topic. We watched the video ( you tube simple songs ) Who took the candy from the trick and treat bag. Later on we played the game ourselves with a simplefied question. Who took the cookie from the bag? Was it the vampire, the ghost, the pumpkin , the spider or the skeleton or the witch ? The sentence that we used was; for exemple ; Ghost ,....Have you got the cookie? Mostly by their shining face it was easy to guess who took the cookie....but it was a nice game ! 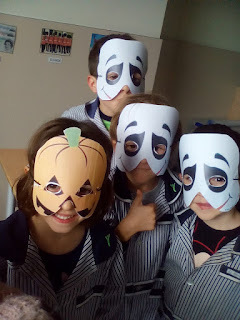 We watched the video Knock knock trick or treat as well and played a running game where in the children had to move like monsters, witches, ghosts, zombies, vampires, pirates, ballerinas, cowboys, skeletons and pumpkins. And we made a pumpkin mask that finally was not orange but had all colours !! P5 In the mood for Halloween. Last week we started the topic Halloween with P5 . This week we played the game ; Who took the cookie from the pumpkin . One student has to close his eyes while another student ( for example with a picture of a vampire) takes a cookie from the pumpkin . The teacher asks ; Was it the witch, the vampire, the spider, the ghost, or the skeleton. We used the question ,for example. Vampire ? Have you got the cookie ? On You tube you can watch the song , Who took the candy from the Trick and Treat bag. The game was inspired by this song. We made masks and painted faces and played the spider game where in the children have to pass the line moving like a monster, a ghost, a pumpkin , a pirate , a princess , a zombi, a skeleton or a spider. The students always like games with movements so learning English is real fun !! Of course Halloween is an inspiring topic ! We designed a Halloween invitation where in the students had to write the place of the party , what kind of dressing code, and at what time it wass going to start. Later on we acted out different Hallloween situation where by one team had to guess the actions of the other team. Later on we played the following game: the students made a living statue with objects related to Halloween. The teacher made a picture. One student left the classroom. The living sculpture ws changed (3 things) The student had to guess what had been changed. 2nd ESO Halloween and the perfect boyfriend ???? 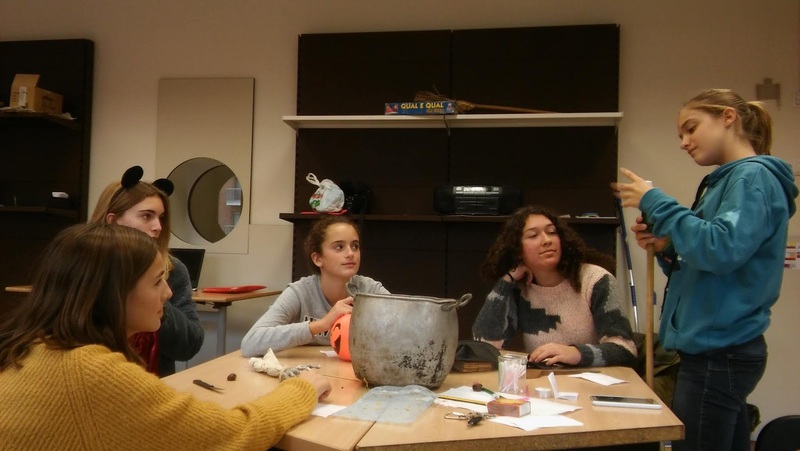 Halloween is in the air ,so last week we made a Halloween invitation and this week we played a game related with Halloween. 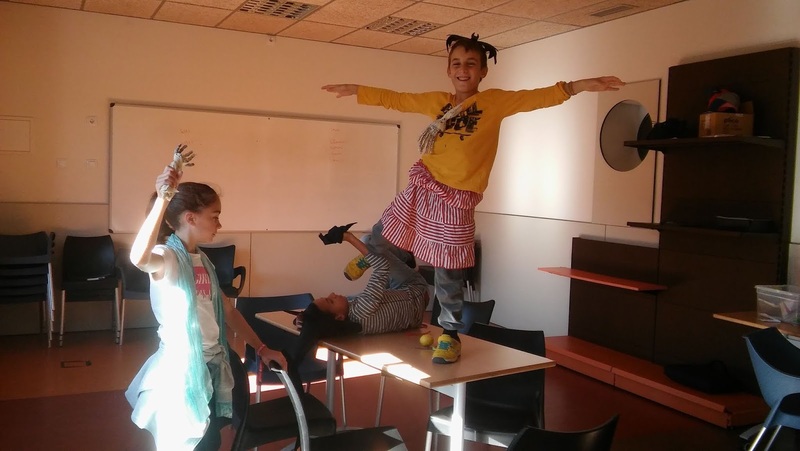 Each student had to act out 3 actions and the other students had to find the past simple verbs related to the action and make the sentences. A good way to repeat and learn some irregular verbs using the past simple. The same day we watched a video where Lilly superwoman makes her perfect boyfriend. There appeared a perfect boyfriend, like a sort of Frankenstein from a box with a manual . Later on we talked about the qualities a perfect boyfriend should have. Hello again to all who follows us! Since the last post we have done many things. The first that I want to share with you is about adjectives. We learnt different adjectives to describe people and put them into practice doing an exercise at class. It was a great class! We had fun! We did an activity about what a backpack is and what objects it normally has in. They had to colour, to cut and to paste. It was a good activity in order to go over the vocabulary we had learnt the previous sessions, which were dedicated to the classroom and the school. We had fun and everyone did it great! Hello again to all who follows this blog! A few weeks ago we spent three sessions to work on the school as a topic. Previously, we had got in contact with the classroom (main objects, main actions or things that happen there and so on). So, it seemed logic to keep working on the same. We discover how many facilities a standard school has and how we name each one in English. After that, we decided to make something a bit more creative: the children had to draw his or her favourite school. The activity was great and we had fun a lot! The first experience was about static electricity. To watch how it works we did a Dancing Snake. With tissue paper, markers, scissors, a balloon and some pacience.... snakes of many colours were jumping and dancing over the table. last 16th October ot was CPR Awareness day. 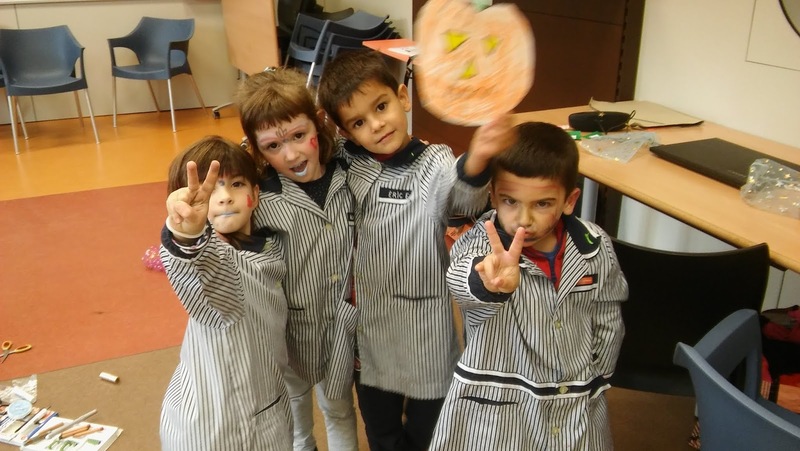 3rd and 4th grader went out together and visit the special activity that Emergency Services and the Hospital prepared at The Firal. They had the opportunity of practising with the dummies and they visit the interior of an ambulance. Thanks to doctors and nurses that spended time with us for all the interesting explanation and kind attention! 5th grade Experiment 1 The floating candle !!! With the 5th graders we started the project : Experiments. For the first experiment we used: a tea candle, blue flowers ( for colouring the water) , water, a plate , a jar and matches. What happens , when you put a burning candle in a plate with some blue water and you cover it with a jar ? Yessss ...because of the lack of oxygen the water is raising and the candle is floating. We did the experiment several times with more water, less water and of course it was exciting to lit the candle with the matches. The 6th graders tried to build up a ping pong circuit. The idea was to use different objects and materials to create a cause and effect system. We used pots, bowls cups domino blocks etc . The students had to explain how they made it , what kind of material they used. etc. We inspired ourselves by watching a video of some experts doing this job. It seemed that we could do something like them but it was more difficult than expected.. The result a lot of frustration and a lot of fun ! 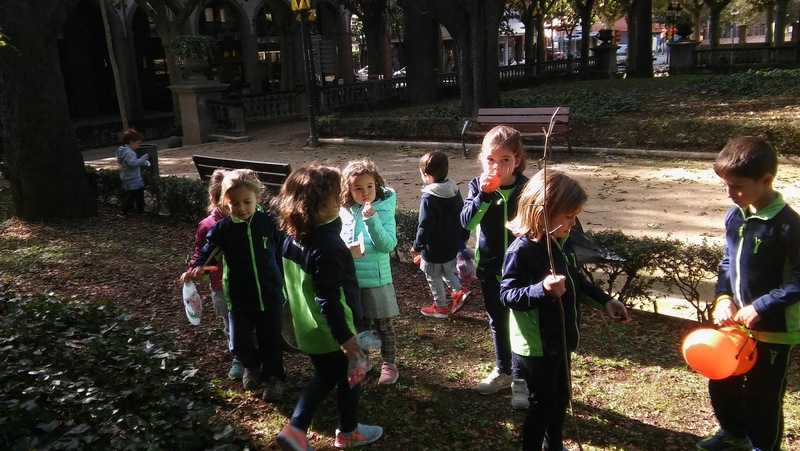 P5 Looking for chestnuts and autumn leaves in Plaza Carmen. With P5 we went to Plaza Clara to find beautiful leaves and chestnuts. it was great !! Afterwards, at school we put the leaves under a paper , rubberd it with a crayon ....and abracadabra... A beautiful coloured leaf ! We repeated the songs; Hokey Pokey, and Put on your shoes, from simple songs you tube. P4 Playing with beautiful leaves and chestnuts. It's Autumn so we played and did craft with chestnuts and leaves. Each student chose one of the leaves to put under a piece of paper and rubbed the paper with a crayon ...the result a beautiful coloured leaf !! the ball etc. whatever a student wants. new vocabulary :In the house...Out of the house....On the chair, under the table...on the table. The new song is the Hokey Pokey song actions from simple songs you tube..
We are using vocabulary such as cutting, glue, and scissors. the group did a nice work doing a writing poems, listening and speaking activity based in the song SPARK from Amy MacDonald. 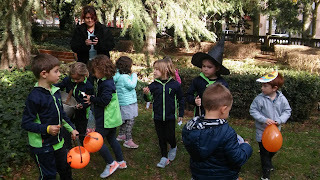 First graders started a bright new stage and at the English class we began the course learning vocabulary related to the material that they are using at class. Have you see the great pencil case they made? 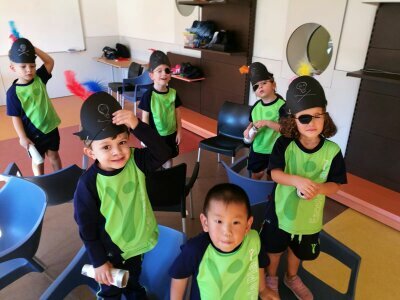 P5 Dressing up like pirates. This week we continue with the topic Pirates. We repeated the sentence ; The pirate is wearing....pink trousers...a black shirt etc. And we played a game using flashcards and he question ...Have you got the Pirate ? .....Answer Yes....Or NO I've got the shark etc..... We had fun !!! 6th grade Who is the most dangerous???? Last week we did different activities. We watched a video about how to be a Ninja and afterwords we made a ninja of pipe cleaners and beats. 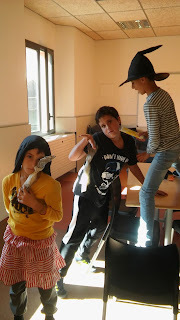 This week we worked on comparetives and superlatives by doing theatre. One team had to act out for example ; 1 crazy, 2 crazier 3 The craziest. The other students had to guess who was number 1, 2 or 3. And some good news ! We have a new teacher in our team ! Her name is Judith , so of course we had to present ourselves to her. So more inspiration as she used to live in Scotland. P5 Pirates ! What are you wearing ? 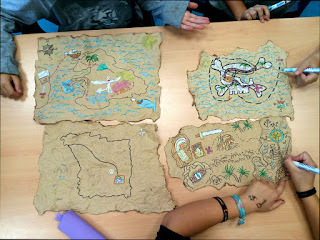 Last week we started the topic pirates with P5. The students liked it a lot! We played different games where by the students had to use the following sentences; The pirate is wearing a yellow shirt. The pirate is wearing some green trousers. The pirate is wearing a blue hat. 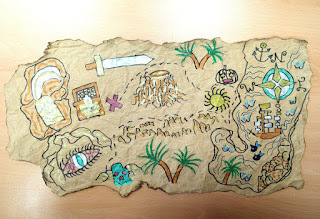 As well they had to find the feathers of the parrot and make a real treasure map. Vocabulary: is wearing a red jacket etc, I see ; a boat, a parrot, a crocodile ,an island, a treasure, a map. We repeated bodyparts and colours. P 4 We are the happy pirates ! This week we started the topic pirates. During the activity we're repeating some colours, animals and body parts as well. 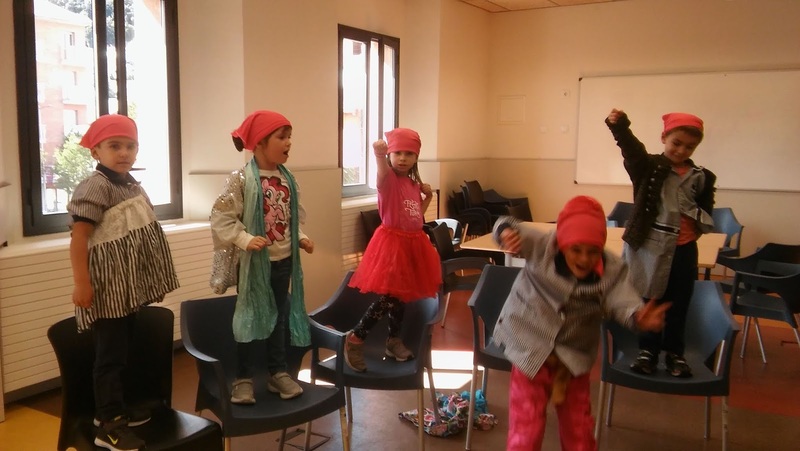 The students like to move so we did a lot of running games and danced and sang along a song. We used the song We are happy pirates can't you see , there's room on the ship for you and me ! (simple songs you tube). In this song they repeat just a few words like wave your hands, pull up your knees. The students were very excited to be pirates. Vocabulary : We are pirates, in the house, outside the house, in the sea, run , wave your hands, parrot, hat, feather. I want a red feather, I want a blue feather etc. The first weeks of this course 5th graders did a great job. Using the letters of their names they look for words that describe them, their likes and dislikes. Hello and welcome back again to all of you, parents and readers! Once again here we are starting a new course. I wish we will be keeping in contact through this blog all along the course. The first week of the present course was dedicated to the holidays. The activities planned were all about holidays through speaking sessions, either all together or individually or in pairs. We also had to draw a picture that represented our holidays. For example: a monument, a landscape or a place we used to go during summertime. 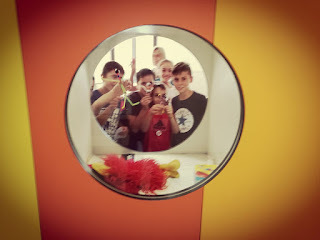 We had fun and enjoy it a lot! Welcome back to all of you, parents and readers! Here we are again, starting a new course. I wish we will be keeping in contact through this channel all along the year. The first week of this new year it was dedicated to give a great welcome back to all the children. We did so dedicating a part of the session to speak about holidays through questions like these: "where did you go...? ; what did you do...?, did you have fun...?, did you travel abroad? and more and more. 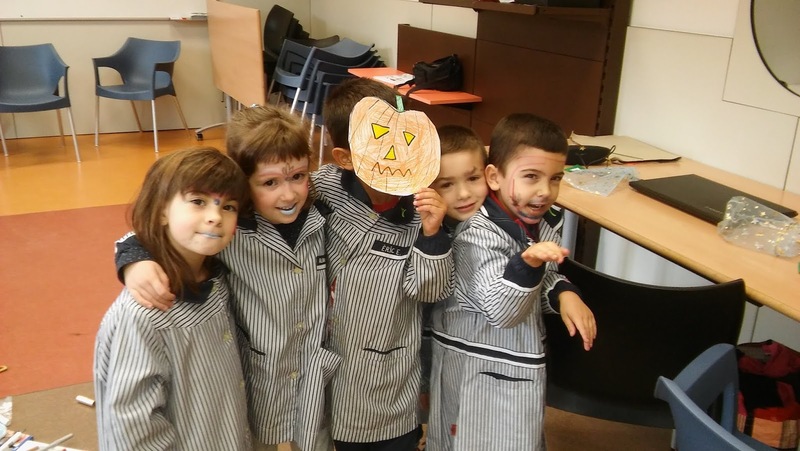 In doing so the children had the opportunity to practise their English and to have fun giving details about the holidays. Cheerful sessions we had such first week! 2nd ESO group started a new course reviewing adjectives, in particular those that describe positive aspects of people. They made a short list of those that they considered that describes them and after they proposed some for describing each of their classmates. The explanaition of why they chose the options they chose lead to an interesting chat. As a closure they created a word cloud using the words on the list and selecting the shape and colours that each of them likes.